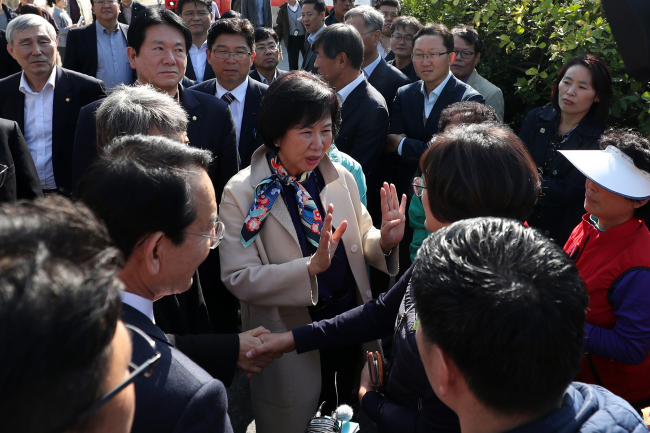 A ruling party lawmaker who sits on the National Assembly’s culture, sports and tourism committee is under fire for allegedly having her relatives and aides invest in properties in Mokpo before the area where they were located was designated as culturally significant. Network broadcaster SBS reported Tuesday that Rep. Sohn Hye-won of the ruling Democratic Party of Korea encouraged relatives, acquaintances and a foundation led by her husband to purchase nine buildings between March 2017 and September last year in an old district of the southwestern port city. The properties were part of a site designated as a “modern history and culture space” in August last year by the Cultural Heritage Administration. The site, spanning 114,000 square meters, is the first township-sized “registered cultural heritage” area to be so designated. Normally, the honor is reserved for architectural structures or areas with important historical monuments. Building prices in the area jumped fourfold after the decision was announced, from about 1 million won per 3.3 square meters to about 4 million won. On Friday, the Dong-a Ilbo newspaper reported that of the 602 properties within the cultural heritage site, 17 buildings and three plots of land belonged to Sohn’s husband’s foundation or to nephews and the husband of Sohn’s aide. Sohn said she intended to sue SBS and that she “bets her life” on her innocence. The Cultural Heritage Administration said in a statement that registration of cultural heritage is determined after thorough on-site inspections by experts and deliberation by the cultural heritage committee, and is not something that can be influenced by an individual. None of the government’s budget has been spent on the modern history and culture space in Mokpo, the culture body said, adding that it would support the public use of the space and the preservation of cultural heritage there. Sohn became Korea’s first designer-turned-lawmaker by winning in the 2016 parliamentary election. She sat on the parliamentary committee for education, culture, sports and tourism until July last year, when she moved to a spinoff called the the culture, sports and tourism committee. The standing committee oversees the Cultural Heritage Administration. Sohn has said she encouraged her relatives to buy property in Mokpo because no one would go there, and that she was not interested in making money through property speculation. The lawmaker also faces accusations that she pressured the National Museum of Korea to hire a researcher from the National Folk Museum of Korea since 2017.